Welcome to another edition of Constellation Friday! Today, in honor of the late and great Tammy Plotner, we take a look at the dragon itself – the Draco constellation. Enjoy! 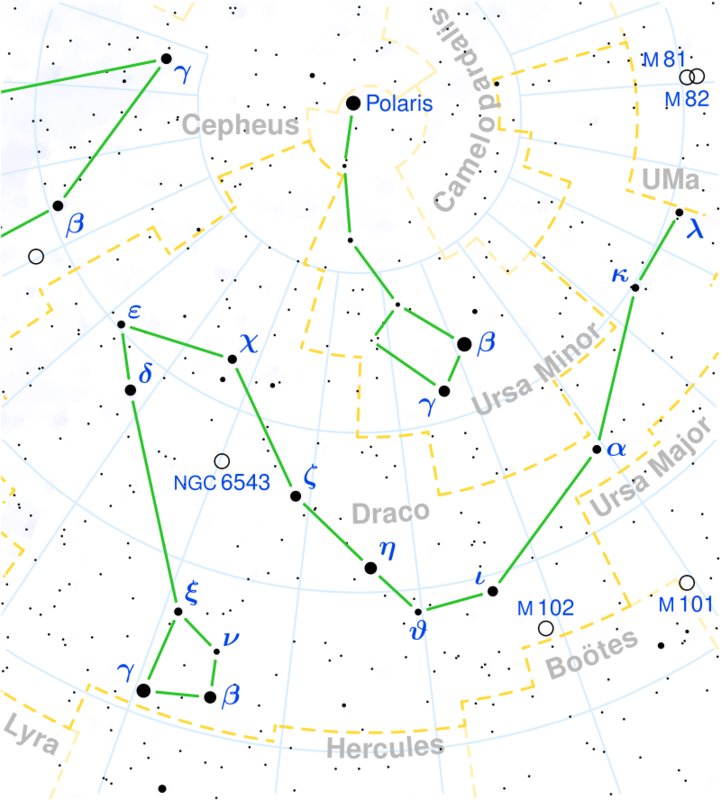 One of the constellations included in this treatise was Draco, which is located in the northern hemisphere and contains the north pole of the ecliptic. Today, it is one of the 88 modern constellations recognized by the International Astronomical Union (IAU) and is bordered by the constellations of Bootes, Camelopardalis, Cepheus, Cygnus, Hercules, Lyra, Ursa Minor, and Ursa Major. Welcome to another edition of Constellation Friday! Today, in honor of the late and great Tammy Plotner, we take a look at the “Swan” – the Cygnus constellation. Enjoy! One of the constellations identified by Ptolemy was Cygnus, otherwise known as “the Swan”. The constellation is easy to find in the sky because it features a well-known asterism known as the Northern Cross. Cygnus was first catalogued the by Greek astronomer Ptolemy in the 2nd century CE and is today one of the 88 recognized by the IAU. It is bordered by the constellations of Cepheus, Draco, Lyra, Vulpecula, Pegasus and Lacerta. Because the pattern of stars so easily resembles a bird in flight, Cygnus the “Swan” has a long and rich mythological history. To the ancient Greeks, it was at one time Zeus disguising himself to win over Leda, and eventually father Gemini, Helen of Troy, and Clytemnestra. Or perhaps it is poor Orpheus, musician and muse of the gods, who when he died was transformed into a swan and placed in the stars next to his beloved lyre. It could be king Cycnus, a relative of Phaethon, son of Apollo, who crashed dear old dad’s fiery sky chariot and died. Cygcus was believed to have driven up and down the starry river so many times looking for Phaethon’s remains that he was finally transformed into stars. No matter what legend you choose, Cygnus is a fascinating place… and filled with even more fascinating areas to visit! 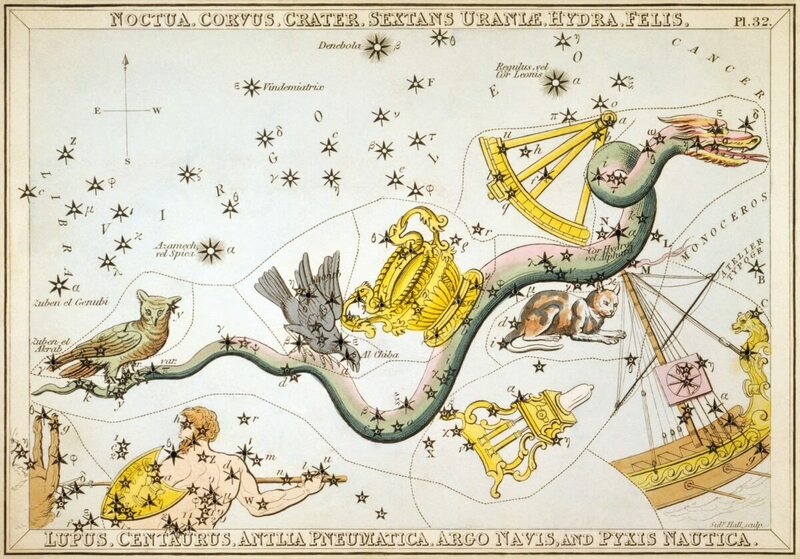 Because of its importance in ancient Greek mythology and astrology, the sprawling constellation of Cygnus was one of Ptolemy’s original 48 constellations. To Hindu astronomers, the Cygnus constellation is also associated with the “Brahma Muhurta” (“Moment of the Universe”). This period, which lasts from 4:24 AM to 5:12 AM, is considered to be the best time to start the day. Cygnus is also highly significant to the folklore and mythology of many people in Polynesia, who also viewed it as a separate constellation. These include the people of Tonga, the Tuamatos people, the Maori (New Zealand) and the people of the Society Islands. Today, Cygnus is one of the official 88 modern constellations recognized by the IAU. Flying across the sky in a grand position against the backdrop of the Milky Way, Cygnus consists of 6 bright stars which form an asterism of a cross comprised of 9 main stars and there are 84 Bayer/Flamsteed designated stars within its confines. 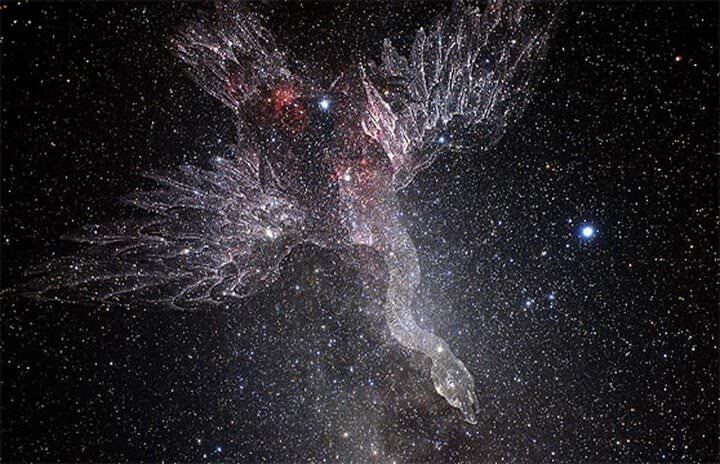 It’s most prominent star, Deneb (Alpha Cygni), takes it name from the Arabic word dhaneb, which is derived from the Arabic phrase Dhanab ad-Dajajah, which means “the tail of the hen”. Deneb is a blue-white supergiant belonging to the spectral class A2 Ia, and is located approximately 1,400 light years from Earth. In addition to being the brightest star in Cygnus, it is one of the most luminous stars known. Being almost 60,000 times more luminous than our Sun and about 20 Solar masses, it is also one of the largest white stars known. Deneb serves as a prototype for a class of variable stars known as the Alpha Cygni variables, whose brightness and spectral type fluctuate slightly as a result of non-radial fluctuations of the star’s surface. Deneb has stopped fusing hydrogen in its core and is expected to explode as a supernova within the next few million years. 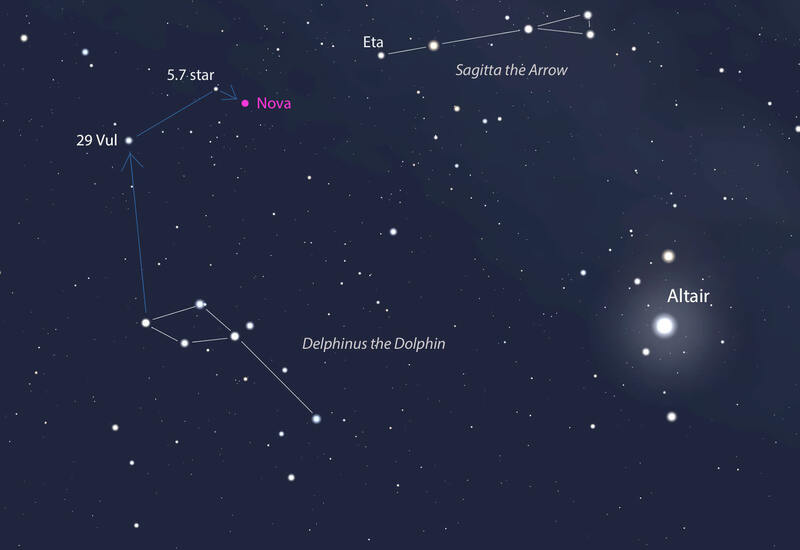 Together with the stars of Altair and Vega, Deneb forms the Summer Triangle, a prominent asterism in the summer sky. Next up is Gamma Cygni (aka. Sadr), whose name comes from the Arabic word for “the chest”. It is also sometimes known by its Latin name, Pectus Gallinae, which means “the hen’s chest.” This star belongs to the spectral class F8 lad, making it a blue-white supergiant, and is located approximately 1,800 light years from Earth. It can easily seen in the night sky at the intersection of the Northern Cross thanks to its apparent magnitude of 2.23, which makes it one of the brightest stars that can be seen in the night sky. It is also believed to be only about 12 million years old and consumes its nuclear fuel more rapidly because of its mass (12 Solar masses). Then there’s Epsilon Cygni (ak. Glenah), an orange giant of the spectral class K0 III that is 72.7 light years distant. It’s traditional name comes from the Arabic word janah, which means “the wing” (this name is shared with Gamma Corvi, a star in the Corvus constellation). It is 62 times more luminous than the Sun and measures 11 Solar radii. Delta Cygni (Rukh), is a triple star system in Cygnus, which is located about 165 light years away. The system consists of two stars lying close together and a third star located a little further from the main pair. The brightest component is a blue-white fast-rotating giant belonging to the spectral class B9 III. The star’s closer companion is a yellow-white star belonging to the spectral class F1 V, while the third component is an orange giant. Last, there’s Beta Cygni (aka. Albireo) which is only the fifth brightest star in the constellation Cygnus, despite its designation. This binary star system, which appears as a single star to the naked eye, is approximately 380 light-years distant. The traditional name is the result of multiple translations and misunderstandings of the original Arabic name, minqar al-dajaja (“the hen’s beak”). It is one of the stars that form the Northern Cross. The binary system consists of a yellow star which is itself a close binary star that cannot be resolved as two separate objects. Its second star is a fainter blue fast-rotating companion star with an apparent magnitude of 5.82 that is located 35 arc seconds apart from its primary. Cygnus is also home to a number of Deep Sky Objects. These include Messier 29 (NGC 6913), an open star cluster that is about 10 million years old and located about 4,000 light years from Earth. It can be spotted with binoculars a short distance away from Gamma Cygni – 1.7 degrees to the south and a little east. Next up is Messier 39 (NGC 7092), another open star cluster that is located about 800 light-years away and is between 200 and 300 million years old. All the stars observed in this cluster are in their main sequence phase and the brightest ones will soon evolve to the red giant stage. 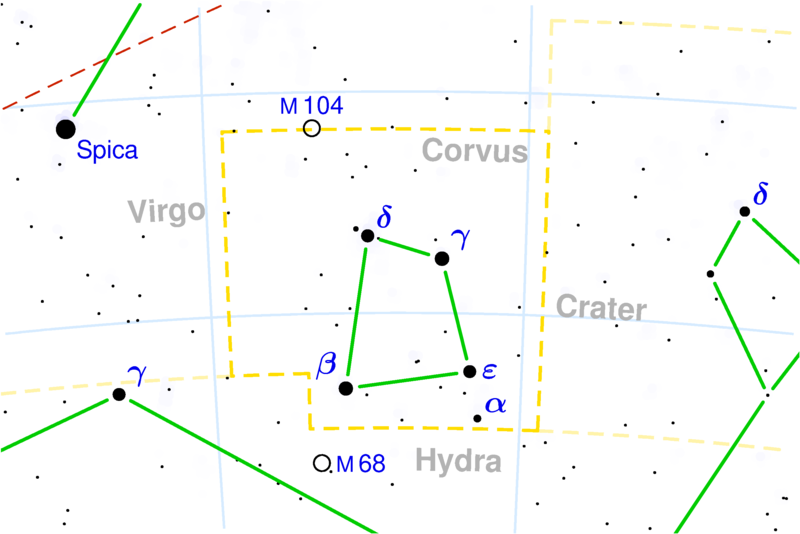 The cluster can be found two and a half degrees west and a degree south of the star Pi-2 Cygni. There is also the Fireworks Galaxy (NGC 6946), an intermediate spiral galaxy that is approximately 22.5 million light-years distant. The galaxy is located near the border of the constellation Cepheus and lies close to the galactic plane, where causes it to become obscured by the interstellar matter of the Milky Way. Then there’s the famous X-ray source known as Cygnus X-1, which is one of the strongest that can be seen from Earth. Cygnus X-1 is notable for being the first X-ray source to be identified as a black hole candidate, with a mass 8.7 times that of the Sun. It orbits a blue supergiant variable star some 6,100 light-years away, which is one of two stars form a binary system. Over time, an accretion disk of material brought from the star by a stellar wind has formed around Cygnus X-1, which is the source of its X-ray emissions. Cygnus is visible to all observers at latitudes between +90° and -40° and is best seen at culmination during the month of September. For a period of 15 days around the peak date of August 20, watch for the Kappa Cygnid meteor shower. This annual meteor shower has a radiant near the bright star Deneb and an average fall rate of about 12 meteors per hour. It is noted to have many bright fire balls called “bolides” and the best time to watch is when the constellation is directly overhead. Because Cygus is so rich in things to visit, we shall only touch very briefly on just a few. Let’s begin with our unaided eye as we take a look at the brightest star of the constellation, Alpha Cygni – Deneb. Here we have not only an extremely luminous blue super giant star – but a pulsing variable star, too. Its changes are minor – only about 1/10 of a stellar magnitude, but Deneb is its own prototype. Its stellar oscillations are very complex, consisting of multiple pulsation frequencies as well as a fundamental one. This means changes in brightness occur between 5 and 10 days apart, but that’s a good thing. If the changes weren’t small, Deneb would blow itself to bits! If you are looking at Cygnus for an area well away from city lights on a night when there is no Moon, look just northwest of Deneb for the North America Nebula (NGC 7000). This is an excellent emission nebula that covers as much area of the sky as 10 full Moons! At 3 full degrees, you’ll be looking for a vague, misty patch of silver-ness that about as broad as your thumb held at arm’s length. While telescopes and binoculars are grand, remember this particular region is so large that you can easily over magnify it and often your unaided eye is all you need to catch this elusive interstellar cloud of ionized hydrogen (H II region). Now, get out your binoculars and let’s dance! Messier 29 is very easy and bright and you can find it about a fingerwidth south and a little east of Gamma Cygni – the “8” shape on our map. This open cluster of stars has just a handful of bright members and will look like a small rendition of the “Big Dipper”. M29 is about 7,200 light years away from Earth, so the fact we can see it at all in binoculars is pretty impressive! Now, try Messier 39. You’ll find this one about a fingerwidth west and southwest of Pi2, which looks like TT2 on our map. This galactic star cluster is far brighter and richer than the last. It will show as a triangle shape with bright stars in each corner and a couple of dozen fainter stars captured within the center. M39 is only about 800 light years away from our solar system, but it could be as much as 300 million years old! Don’t put your binoculars away just yet. You’ve got to visit Omega 2 before you stop! Its name is Ruchbah and it’s a double star about 500 light years from Earth, consisting of a magnitude 5.44 star of spectral class M2 and a 6.6 magnitude star of spectral class A0. The stars are well separated at 256″ apart and can be seen in binoculars and totally glorious in a telescope. Because of the color contrast (red main star and blue companion), Ruchba is a beautiful object for amateur astronomers. Now try Beta Cygni – Albireo. It is also known as one of the most attractive and colorful double stars in the sky. Beautiful Beta 1 is an orange giant K star and Beta 2 is a main-sequence B star of a soft, blue hue. If you can’t separate them in your binoculars, use a telescope! This seasonal favorite is one that’s not to be missed! Now, let’s try a couple objects for the telescope. One of the true prizes of the Cygnus region for any telescope is the Holy Veil (NGC 6960, 6962, 6979, 6992, and 6995). You’ll find it just south of Epsilon Cygni and the easiest segment to find is 6960, which runs through the star 52 Cygni. This is an ancient supernova remnant covering approximately 3 degrees of the sky and an experience you won’t soon forget if you are viewing from a dark sky site. Even though it is any where from from 1,400 to 2,600 light-years light years away, you’ll find long and wondrous tongues of material to capture your interest and delight your eye and you follow them to their ends! More challenging is the Crescent Nebula (NGC 6888 or Caldwell 27) located at RA 20h 12m 7s Dec +38 21.3′. This is an emission nebula fueled by a Wolf-Rayet star located about 5000 light years away. It is formed by the fast stellar wind careening off illuminating the slower moving wind ejected by the star when it went into the red giant star stage. What’s left is a collision… a shell and two shock waves… one moving outward and one moving inward. A what a grand one it is! For galaxy fans, you have got to point your telescope towards NGC 6946, the “Fireworks Galaxy” (RA 20h 34m 52.3s Dec +60 09 14). Who cares if this barred spiral galaxy 10 million light years away? This is one supernovae active baby! At one time, it was widely believed that NGC 6946 was a member of our Local Group; mainly because it could be easily resolved into stars. Now, for the really cool part – understanding barred structure. Thanks to the Hubble Space Telescope and a study of more than 2,000 spiral galaxies – the Cosmic Evolution Survey (COSMOS) – astronomers understand that barred spiral structure just didn’t occur very often some 7 billion years ago in the local universe. Bar formation in spiral galaxies evolved over time. A team led by Kartik Sheth of the Spitzer Science Center at the California Institute of Technology in Pasadena discovered that only 20 percent of the spiral galaxies in the distant past possessed bars, compared with nearly 70 percent of their modern counterparts. This makes NGC 6946 very rare, indeed… Since its barred structure was noted back in Herschel’s time and its age of 10 billion years puts it beyond what is considered a “modern” galaxy. It that all there is? Not hardly. Try NGC 6883, an open cluster located about 3 degrees east/northeast of Eta Cygni. It’s a nice, tight cluster that involves a well-resolved double star and a bonus open cluster – Biurakan 2 – as well. Or how about NGC 6826 located about 1.3 degrees east/northeast of Theta. 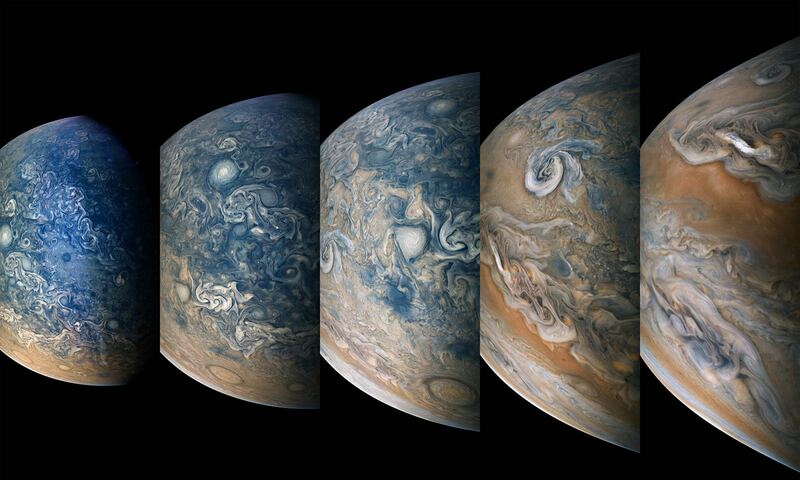 This one is totally cool… the “Blinking Planetary”! This planetary nebula is fairly bright and so is the central star… but don’t stare at it, or it will disappear! Look at it averted and the central star will appear again. Neat trick, huh? Now try NGC 6819 about 8 degrees west of Gamma. Here you’ll find a very rich, bright open cluster of about 100 stars that’s sure to please. It’s also known as Best 42! There’s many more objects in Cygnus than just what’s listed here, so grab yourself a good star chart and fly with the “Swan”!